Bindara Station is located within the traditional lands of the Barkindji people. It is believed that the ancestors of the aboriginal tribes in the West Darling migrated from tropical Asia. As they followed the rivers down from the north they found an inexhaustible supply of fish in the waters and stalked the marsupials that cropped the grasses on the plains. In the course of time the rains began to fall less frequently, the level of the lakes fell, and the plains became dry with only desert vegetation. The strongest tribes fell back on the rivers and adapted their way of life. Nomads wandered in the desert lands, moving on from one dried-up water hole to another. Generally there were two main types of aborigine whole tribal territories lay within or partly within the west Darling; the strong, handsome and aggressive river tribesmen, and those of the outback, of lesser physical stature. The Darling River tribal complex is referred to as Barkindji. However, within the tribe were tribal groups made up of only one or two families. Each small band was allocated a part of the tribal territory and foraged individually for food. The whole tribe only gathered at appointed seasons and for specific reasons at places where the land would for a limited time provide food for everyone. There was no love lost between the people of the river and those of the outback. The warriors of the river were fierce in defence of their favoured location and did not welcome any encroachment by their neighbours of the dry interior. They never ventured far into it without a well-filled kangaroo skin waterbag. The river aborigines were fishermen as well as hunters. Stout hunting spears and strings of boomerangs around the waist were standard accessories. They used nets in backwaters made of kangaroo sinews. They had fishing hooks fashioned out of bone and dried reeds for floats and balls of baked clay for sinkers. The woman and children gathered mussels, tortoises and yabbies, from the shallow water and dug for grubs and roots along the river banks. Young boys gathers birds’ eggs and wild honey. 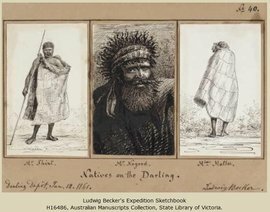 Within the tribal borders were places where custom dictated that the aborigines should gather together for ceremonies, barter good, and to feast. One such site was Laidley’s ponds (Menindee).